Top our Mango Salsa-Chicken Sandwich with a sweet salsa. 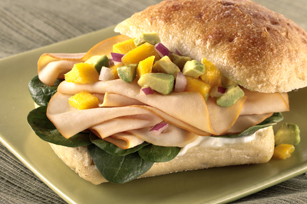 With mangos, avocados, onion & more, our Mango Salsa-Chicken Sandwich is a great weeknight option. Combine mangos, avocados, onions and lime juice. Spread mayo onto bottom halves of rolls. Fill with spinach, chicken and mango salsa. Salsa can be prepared in advance. Store in tightly covered container in refrigerator up to 8 hours before using as directed. Prepare using OSCAR MAYER Natural Slow Roasted Turkey Breast.